Well, I have to admit that this theme left me scratching my head a bit. I don't have little people playing soccer or football or baseball -- yet anyway! -- so I didn't plan to enter a photo this week. But then we were at the pool today and the girls were having an absolute ball. They certainly aren't exhibiting any Michaels Phelps-like swimming skill but I think splashing with enthusiasm counts as a sport. In this photo I really like how you can see the water sheeting down Michal's arms, flying from her fingers and beading on her face. I also really like the photo converted to black and white because I think it really calls attention to the detail of all the splashing water. Stunning photo of a beautiful child. And I love the swimsuit! What a wonderful picture! 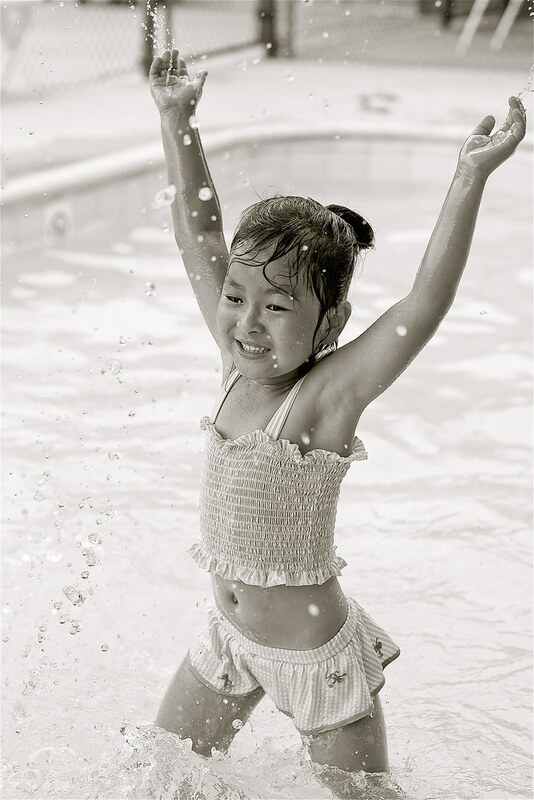 I love the joy on her face and the drops of water! LOVE IT!